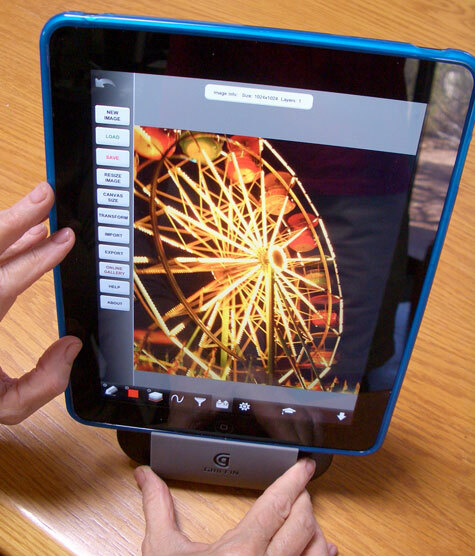 Guest iPad gear review by Jackie Richards – Part Four. Many of the items reviewed below will make great stocking stuffers any time of year. WaterField’s iPad Wallet has an clever design for storing and carrying an iPad plus an Apple Wireless Keyboard and several accessories. It is a premium all-weather product. The construction and design are stylish, attractive, and suitable for men and women. This tote can be ordered with or without two kinds of strap and/or D-rings, as customized from the company’s web site. Six outer colors are available. The Wallet’s rectangular shape is enhanced by genuine leather edging, in addition to rugged outer material. Interior padded pockets “keep your iPad and Keyboard separate and safe,” according to WaterField, and that claim is accurate. A loose premium nylon mesh rear pocket is deep enough for a small purse, several cables, or a book. An iPod tucks very snugly into its interior pocket. 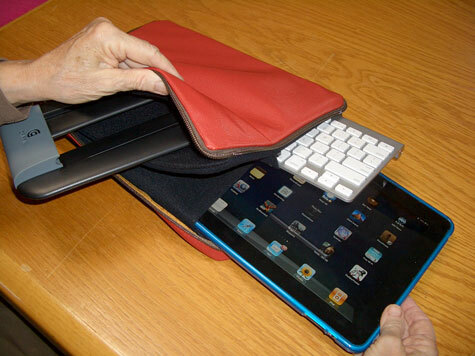 The keyboard pocket area is not as tight, but it is safe and secure. 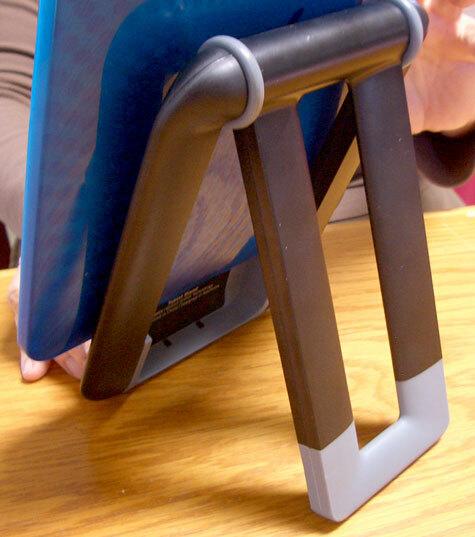 Guest reviewer Jackie Richards particularly likes that she can carry her Griffin Tablet iPad stand (reviewed below) in a separate interior zone. A rugged, smooth zipper is on two of iPad Wallet’s four sides. When the case is loaded and zipped shut, the closed Wallet is substantial yet compact. Unless you prefer holding this sleeve like a large book, Jackie recommends you pay an extra $19 for WaterField’s Suspension Strap Mini. Our evaluation iPad Wallet didn’t arrive with one, but this strap will come in very handy. 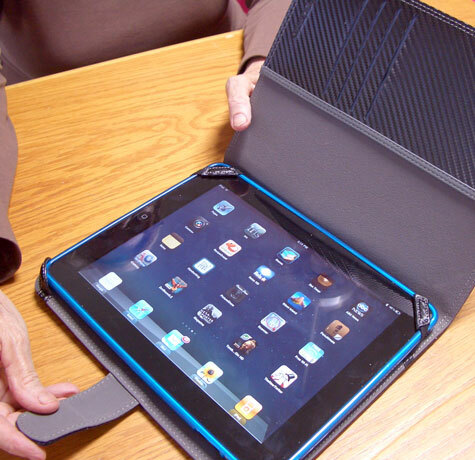 At nearly $100 for the case plus strap, this iPad sleeve is a little expensive. WaterField gear is top quality for top prices. Your iPad, keyboard, and accessories will be happy as pearls within a tight, padded oyster shell. The hidden pen is “a bonus,” says Jackie, “turning this iPad stylus into a high-end desk accessory.” She wants Hard Candy to add a pocket clip, or loop tip end, or a slightly flat side, to keep this stylus + pen from rolling off a table and disappearing forever under the furniture or in a floor heating vent. 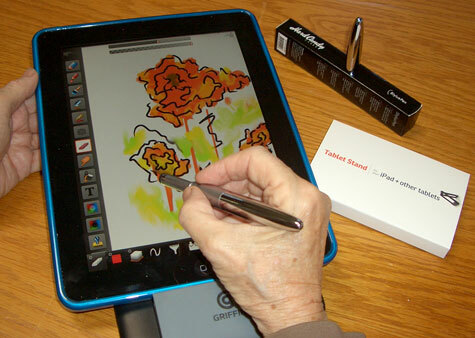 “A nice addition to the package would be a small pen stand like the Wacom Tablet includes for their stylus protection,” says our reviewer. This tablet computer stand’s composite materials have a pleasant feel and a hefty design, plus a handsome appearance. It is a solid easel when in upright mode, with “very good weight and balance in the tall mode,” according to our guest reviewer. Jackie Richards’ favorite feature is that her iPad fits into the stand comfortably even when the iPad is wearing her favorite iFrogz rubber protective Silicone Wrapz, reviewed previously. Read Howard’s prior review of a similar product first here. Jackie’s thoughts are below. She did not read Howard’s evaluation. The elastic interior corner grip bands fit over her iPad when it is both in and out of her precious iFrogz Silicone Wrapz protective sleeve. “Griffin’s design is attractive, easy to carry, protective, and secure,” she says.